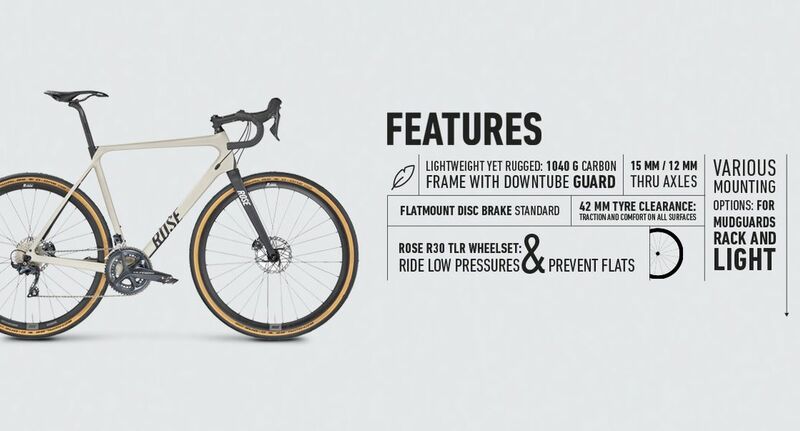 The BACKROAD MULTICROSS impresses with a lightweight carbon frame weighing only 1040 grams, internal cable routing and a ROSE Disc full-carbon fork with thru axle that regularly scores best mark in international tests. The 38 mm wide G-ONE Allround Evo tyres by Schwalbe offer comfort and strength, which makes them perfect for riding on field and forest paths. In combination with robust ROSE R Thirty Disc wheels, you’ll enjoy high speed and great control on any trail! Gears are changed with Shimano’s reliable Ultegra. The Level Nine Race bar provides optimal handling in any situation. A shock-absorbing ROSE RC-170 carbon seat post and an Ergon SMC-40 Sport Gel saddle offer comfort on long distances. ROSE R THIRTY DISC black 28"